Long ago, owners of brick-and-mortar stores figured out that if a customer came into the store to look for a dress, they were more likely to make a sale by showing her a rack of dresses as opposed to a collection of winter coats. Generic marketing for your eCommerce store is the online equivalent of showing every customer a collection of winter coats regardless of when or why they come to your store. By using advanced marketing automation, you have the ability to show the right products and services to the right customers at the right time. What makes marketing automation campaigns vital for eCommerce? Today’s consumer has a short attention span (and interest span). This is a result of being constantly bombarded with marketing messages across email, social media, and any other digital channel. One way to make your content pop is to make it personal to the consumer. The more personal the marketing message is, the greater the chance you will catch the eye of the person scrolling through his inbox. “Personalization” doesn’t stop at adding the recipient’s name to the subject line. A truly personalized marketing campaign is tailored to the consumer by evaluating browsing history, the initial trigger, and the individual’s purchase patterns. Automation campaigns are a wise way to spend marketing dollars, especially for small and mid-sized businesses. These campaigns see a 14.5% increase in sales productivity. Since the technology allows you to scale your outreach in mass without losing that personal touch, the return on investment is high. Contrary to common belief, email continues to be an important marketing channel for eCommerce. ContactPigeon compared sales made on Valentine’s Day 2017 with that of Valentine’s Day 2018 and found a 17% higher sales rate generated from email marketing from one year to the next. In the past, email marketing had been limited to periodic newsletters, flash sales, and generic drip campaigns. Using marketing automation campaign software to manage your communication lets you harness the power of email marketing around the clock. Once you set up the campaign’s parameters, the automated emails work for you while you are taking care of the other responsibilities. It’s like being in two places at once. The five advanced marketing automation scenarios below can boost your eCommerce conversions by using these. Not everyone comes to your online store for the same reason. Creating different workflows for the different interests your consumers have will deliver a highly personalized and relevant experience to your audience and result in more conversions. Tip from Top Sellers: A big mistake marketers make when it comes to content-based workflow is to freely give out content, but never do any hard selling. The end of the workflow is your chance to ask the consumer to make a purchase. If your workflow has connected with the specific needs and wants of the email recipient, the consumer will be ready to make a purchase. An exit intent is triggered when your website visitor is making a move to leave your site. Most common of this is a pop-up window that asks for an email address in exchange for offers, coupons, or freebies. This is followed by email workflow that continues to engage visitors in order for them to stay close to your brand. To see some great marketing automation campaign examples of exit intent workflows in action, check out the best Shopify stores of 2017. Tip from Top Sellers: Instead of setting up a generic pop up, try to serve the most relevant offer possible based on the category of product the visitor viewed on your eCommerce website. Go a step further and serve an offer from the most popular subcategory he/she visited based on his browsing track record. This targeted strategy will be instantly more relevant and thus more effective. Shops who sell consumables find repurchase reminders highly effective. Your repurchase reminder email will be a welcome sight since you have saved them from running out of their favorite face wash or their pet’s special food. The next time an email from you lands in their inbox, the customer will remember the relief they felt when they received the repurchase reminder. Tip from Top Sellers: In order to set up an effective repurchase reminder you need to know three things: the product purchased, the average time between purchases, and the best way to craft the email message. Even if you have never done so before, you canfollow the step by step instructions to create your own repurchase reminders. It may be the “grandpa” in terms of email workflows, but it still works for one main reason: we all feel special on our birthday and we remember anyone who gave us a gift. Setting up a workflow based on customer’s browsing or purchasing track record and focusing on the subcategories he/she was most engaged with can easily help you come up with a surprise gift for maximum results. 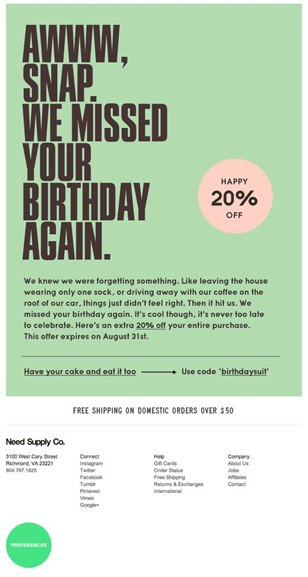 Tip from Top Sellers: Test the birthday automated marketing campaign on the VIPs to see if it works for your particular audience and then scale this tactic up to increase the number of conversions. You could offer an optimal personalized experience by creating a different landing page for every major pay-per-click campaign you run. When the landing page and subsequent workflow directly relate to the ad, there will be a natural flow of conversation between you and the customer. Tip from Top Sellers: Include an exclusive coupon or freebie to each workflow to see your conversion rates grow. You can further grow the referral automatically with a tool like Kudobuzz Reviews app that shares customers review for social proof. In order to maximize your chances of attracting the consumer’s attention (and eventually his wallet too! ), you have to experiment and evolve your marketing strategies. Marketing automation campaigns provide all the necessary, state-of-art tactics to truly personalize your marketing and turn your website visitor into a loyal customer. Even a small to medium sized e-shop can adopt this technology and compete with giants, stealing a remarkable market share. Sign up for your free demo of ContactPigeon and explore the variety of available marketing automation that can skyrocket your eCommerce store. 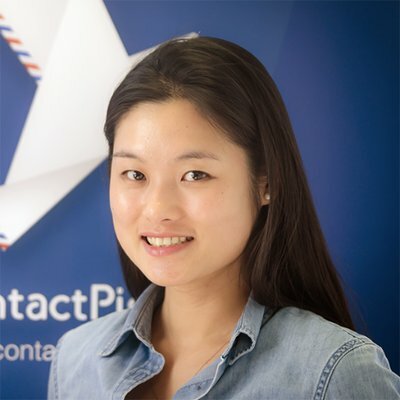 Joyce Qian, Director of Marketing & Growth at ContactPigeon, all-in-one marketing automation tool built to skyrocket eCommerce results. Joyce writes frequently about eCommerce marketing trends while she is not exploring her new home in the ancient city of Athens.